Your skin says a lot about you. It can reveal your age, habits, sun exposure, how much you smile and more. It’s also the largest organ in your body and has a major role in protecting your body from harmful substances. This is why it’s important that you always take care of your skin so that you can stay healthy and make good first impressions. To do this there are a few factors involved: you must use the right skincare products, protect your skin from sun exposure with natural sunscreen, and eat a healthy diet consisting of plenty of nutrients. The latter is perhaps the most important because it’s really what gives your skin that supple, glowing look. It keeps your skin strong and healthy. Healthy skin really comes from the inside out. Your skin reflects what’s going on inside your body. So you can rub all the fancy lotions you want on your skin every day, but if your insides are a wreck then it will definitely show. Diets composed of junk food, and foods lacking in nutrients will lead to tired, dull looking skin with conditions like acne and eczema coming to the surface. If you make sure that you’re consistently giving your body the proper nutrients then you are doing everything to make your skin great. Unfortunately when it comes to eating healthy, most people fail to get the proper nutrients. We live in a world where most food options are not only unhealthy, but are devoid of the basic nutrients we need. This is where vitamin supplements come into play. Vitamins are essential for human health. They play a role in nearly every biological process, and are of course important for skin health and repair. Because vitamins play such an important role, a deficiency in a particular vitamin could put you at risk of skin damage, whether it’s skin cancer or just irritation. Too often people are deficient in vitamins. And most people don’t notice their deficiencies until they get sick, but they may notice subtle changes in their health. A blood test done through a medical professional can detect these deficiencies. So any time you think there could be a problem, go to your doctor and voice your concern. There are a wide variety of nutrients that your skin needs to look, feel and act its best. 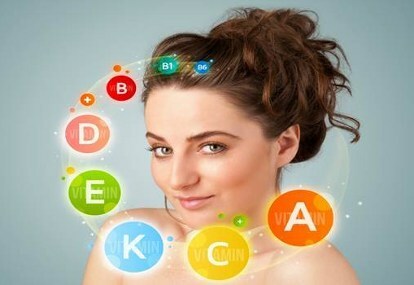 When it comes to vitamins, virtually all of them play a role in one way or another regarding your skin health. We have included product links below for each specific vitamin. This is one of the biggest factors in healthy skin. Vitamin A is essential for the repair and maintenance of skin. It’s also used to treat things like acne and wrinkles on skin both young and old. Those deficient in vitamin A may suffer from dry, brittle skin. It’s also important to note that many skincare products are filled with synthetic vitamin A. Accutane- the powerful acne drug, is composed of retinoids, a vitamin A variant. Retin-A, an anti-aging formula, is also composed of vitamin A.
Vitamin A is most often found in orange foods like carrots and sweet potatoes via beta-carotene, a precursor to vitamin A. It’s also found in dark leafy greens, and organ meats, the latter of which few people eat. We recommend supplementing with Solgar Vitamin A tablets. In general, vitamin B and its subsidiaries such as Biotin play a role in many basic health functions like keeping skin and nails healthy. When used in skin creams, they help even out skin tone and reduce inflammation. Vitamin B is one of the most plentiful vitamins and it’s found in many foods such as rice, oatmeal, eggs, and fruits like bananas. This means few people will be deficient, except for vegetarians who often lack vitamin B-12 which is found in meat. But if you are deficient, then we recommend the Solgar Vitamin B Complex pills. A common ingredient you’ll find in anti-aging products and serums is vitamin C. Trendy items like Hyaluronic Acid often are paired with vitamin C because they are both powerful anti-aging products. The reason for this is that vitamin C is an antioxidant and supports collagen synthesis which means that it allow skin to regenerate. Essentially it means is that this vitamin helps to decrease cell damage while encouraging the proper healing process in the body. The collagen production is what keeps fine lines and wrinkles away. So there’s a reason why vitamin C serum is currently one of the hottest skin products on the market. Vitamin C is also touted as a great way to boost the immune system. Because your skin is a part of the immune system, and the immune system is tied to so many bodily processes, it’s important to get a healthy dose of vitamin C.
If you eat healthy, you should get plenty of Vitamin C as it’s often found in many fruits and vegetables. This includes leafy greens and citrus fruits especially. But to make sure you have enough, we recommend Viva Naturals Vitamin C tablets. Vitamin D is unique from other vitamins in a couple of ways. For one, it’s considered by many to be more than just a vitamin. It’s a hormone as well. This conveys just how important this nutrient is. In addition, it’s produced by the body when exposed to sunlight. This is why people who live in cold, grey climates are often deficient in vitamin D. While you can get the recommended daily amount from a pill, it’s always a good idea to get it from the natural source (i.e. the sun). The problem that arises is that too much sunlight can be bad for skin and this causes sun damage. So it’s in your best interest to get just 15-30 minutes of sun per day, and always make sure to use natural body lotion to protect from burns. Another benefit of vitamin D is that it may help to treat psoriasis. So for those who suffer from this ailment, consider using a vitamin D supplement and keep track of how much your skin improves. People in many northern countries are deficient in vitamin D. If you suspect you are, talk to your doctor and consider supplementing to help get your blood levels up. We recommend Viva Naturals Vitamin D3 pills. This is perhaps the most popular vitamin found in the most popular skin creams. Whether it’s treating dry, rough skin or helping to bring down the size of a blemish, vitamin E is utilized in some capacity. It’s well known that vitamin E is good for your skin, but not many people ask ‘why?’ The reason is that vitamin E is an antioxidant, which neutralizes the effects of free radicals in the body, stopping things like premature aging in its tracks. To get the proper amount of vitamin E, add more nuts and oils to your diet. You can also use a vitamin E cream on your skin. You can also take a supplement such as the Solgar Vitamin E softgels. This nutrient is missing from most people’s diets. In fact, most people aren’t even aware that there is a vitamin K! Vitamin K has a role in helping to heal skin damage such as blood clotting, which is why it can be used post-surgery. It’s also recommended to treat skin irritations, scars, and stretch marks. More and more products are beginning to add vitamin K to their formulas. However, you can get a good amount of vitamin K through your diet by consuming dark leafy greens. This can be tough though, so we recommend the Biotech Pharmacal K1 supplement. While supplements offer a great, convenient way to get all the nutrients you need, it’s always preferable to get your nutrients through food. This means having a comprehensive diet that includes all the vitamins you need. For starters, all good diets should include plenty of fruits and vegetables. These are chock-full of vitamins and antioxidants which help keep your skin healthy and radiant. A good rule of thumb is to consume a lot of variety in your diet in terms of food and food colors. This means eat bright foods like berries and carrots, but also consume dark, leafy greens. This way you will consume the full spectrum of nutrients. If you find that you have a particular deficiency with a vitamin, make sure to add plentiful amounts of that vitamin into your diet. For example, if you’re low in vitamin E then eat more nuts- easy! But again, many foods today have less vitamins than they should because of agricultural practices, which may often require taking a supplement. There are plenty of supplements for each of these vitamins on the market. Vitamin supplements are often good quality, just make sure to do your due diligence before purchasing. Taking the right supplements and eating the right foods is the fastest way to a healthy, youthful look. However, you must remember to be patient throughout this process as it may take a few weeks to a few months to see the effects of these nutrients. A good diet will not make changes overnight, rather it will take some time for the body to acclimate to this new influx of nutrients. This goes for supplements as well. Don’t expect to pop a few pills and then wake up with brand new skin. Like all good things, better skin takes time, but if you start taking the right vitamins and start eating the right foods then your skin will become radiant and glowing before you know it. 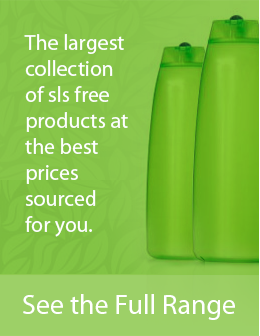 SLSFree.net is a participant in the Amazon Services LLC Associates Program, an affiliate advertising program designed to provide a means for sites to earn advertising fees by advertising and linking to Amazon.